This Monday morning started off chilly but turned into a beautiful sunny day : ) A sail trip went out today and the girls had a lot of fun with two of their favorite CITs, Izzi and Caitlin. The girls were finishing up tournaments this morning as well as participating in their regular morning activities At lunch, banners were awarded to the Eagle and Bluebird cabins. This afternoon was jammed packed with fun. Many campers participated in the horse show! Blue and red ribbons were awarded to all of the participating campers. For many girls, it was a perfect afternoon for Fun in the Sun! After a yummy taco dinner, campers all played a fun game of Dodgeball! However, the Owls sneaked out to prepare something very special for all of camp, Wishing Night! The evening began with a special song and presentation from the Owls. 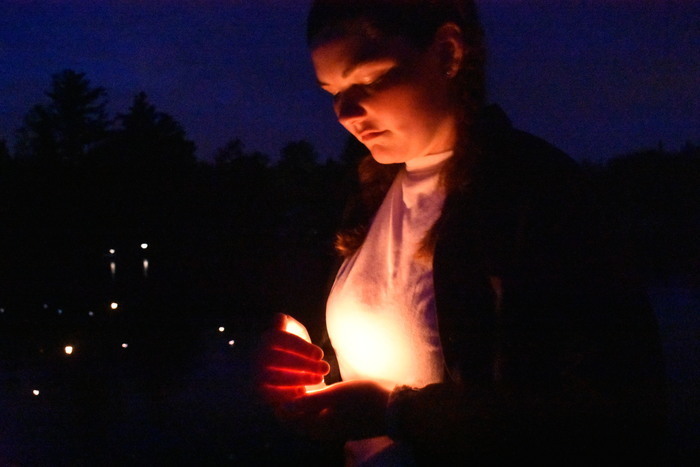 They explained to all of camp that the lights of the evening represented the light within each one of us. They talked about lighting the way for others and keeping their lights shining bright despite the “waves” that may come our way. The Owls lined the path from the field to the waterfront with hundreds of candles. By the time each cabin arrived at the waterfront, the fire was roaring and our own personal candlelit “boats” were ready to send off into the water. Each camper made a wish as she set her boat a float. Legend has it, if your boat is gone in the morning, your wish will come true. We shall see.